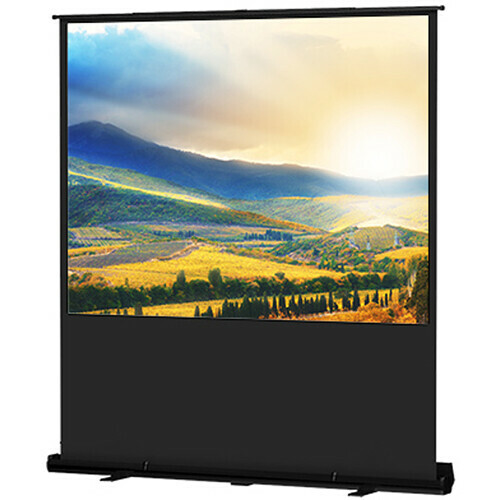 TheDalite 44 x 78" Deluxe Insta-Theater Portable Projection Screen is a uniquely designed screen that lifts up and out of its sleek aluminum case and is ready to use in seconds. Lightweight and self-standing so it goes anywhere. Perfect for traveling or business presentations. Features a unique pneumatic scissor mechanism for raising and lowering the screen surface. Available in 60", 80" and 100" diagonal sizes in NTSC Video format and 73" and 90" diagonal sizes in HDTV format with our exclusive Wide Power screen surface with a gain of 2.2 and a generous 45 degree viewing angle. Wide Power fabric will be seamless in all sizes. Unique feature of a pneumatic scissors mechanism for raising and lowering the screen surface. Available in a 60", 80" or 100" diagonal size with our exclusive Wide Power screen surface. Box Dimensions (LxWxH) 93.0 x 6.0 x 6.0"
93983 Deluxe Insta-Theater Portable Projection Screen (44 x 78") is rated 4.5 out of 5 by 11. Rated 5 out of 5 by Kevin S. from Great value! Our company has owned one of these screens since 2005. We were initially concerned about durability but found that there really weren't any issues. The only damage to the screen during that time was a dent in the case. The surface has remained clean and white and has lasted well. We used this screen in a conference room where a screen couldn't be mounted. It was also used when we needed a larger surface in other locations in the local area. We replaced the screen because it was needed in another location so we left it there. Rated 5 out of 5 by Jeff is jumping! from This works really well for home TV use My son uses this screen to watch TV on. He uses his laptop connected to a projector. He finds the screen is easy to set up and take down (useful for his livingroom) and offers really clear images and colors with very little distortion. We highly recommend this product, especially if you don't want to drill holes in the wall or ceiling of a rental apartment. Rated 5 out of 5 by Kim W. from Fantastically light weight and easy This screen is being used monthly for a camera club meeting. The screen is easy to carry, sets up in less than 1 minute and set up is with ease! Our photos looks bright and even more beautiful with this screen. Rated 4 out of 5 by ICVideo from Great portable screen We show photo montages and same day edits at weddings and this screen in perfect. It's 90 16:9 ratio screen is perfect for our HD videos. The screen quality is excellent and a true white with great contrast. The set-up is as simple as can be. open and extend. We've used it a couple times and couldn't be more pleased. The drawbacks are build quality is sufficient but on the soft side. I don't see the screen for lasting more than a few years of moderate use. The case is thin. I know that it was built with lightness and portability in mind, but for a portable screen I question its durability. The real reason i gave it 4 was simply that when lowering it seems like it would crinkle mainly because the roll-up mechanism seems a little weak and one side doesn't seat properly in the case without an extra push. Aside from longevity issues, I couldn't be more pleased. Rated 5 out of 5 by Chris from Solid Portable AV Screen This screen is very reliable for its price.? The construction is solid and it transports well.? The screen itself is flimsy and must be cared for but as long as you are conscious of that it should last awhile.? Will see how it holds up after some usage. Rated 4 out of 5 by Da-Lited with the screen from Nice Works as advertised and is great for our use as a portable screen for museum programming. The set-up mechanism is pretty slick, and the extender is useful. Well-designed. Rated 5 out of 5 by Aaron from Great Screen! Couldn't be easier and faster to operate. Light wight as well.. perfect combo for quick presentations in different locations, which is what I use it for. Rated 5 out of 5 by Anonymous from Best portable screen out there! To get a screen with this size with this level of portability is amazing! Awesome buy, awesome quality!